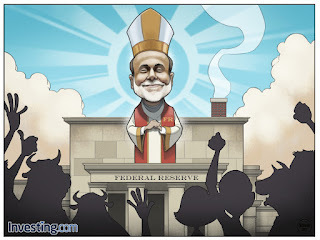 Apparently, Jim Cramer recently said "The markets have faith in Bernanke." This is information I received second-hand, so I can't vouch for its accuracy. But at any rate, that's the source material for this comic, which ties in that statement with the recent election of a new Pope. I really like the way this week's Investing.com comic turned out (just like every week, the idea was theirs and the drawing was mine). Even though I've drawn Ben Bernanke's face 15 times (yeah, I counted), the expression in this version made it enjoyable. "The soul of beatific," as Kerouac said. I even like the composition, in spite of the fact that the focal point is dead center and the proportions are all wrong (Bernanke wouldn't fit through the door of the Fed if he were really that big). But somehow it works and I'm satisfied, so I'm not going to nitpick too much.